I love Vietnamese food, but often struggle at authentic restaurants to find vegetarian options. Pho Xe Lua Viet Thai, under the glowing neon train sign in Chinatown, has a HUGE menu, and I was not only able to find a couple of options, but they happily substituted out the shrimp for tofu and the soup above. The good news? Pho Xe Lua Viet Thai is very very cheap, has an extensive cheap drink list, and a huge menu (if that’s your thing). There are 10 fully vegetarian dishes on the menu, and many can be easily tweaked. True to many Asian hole-in-the-wall restaurants, it’s brightly lit and food arrives very quickly – not the best place for a romantic date, but fun, serviceable, and let me say it again – cheap. The bad news? I maybe didn’t make the best choice. 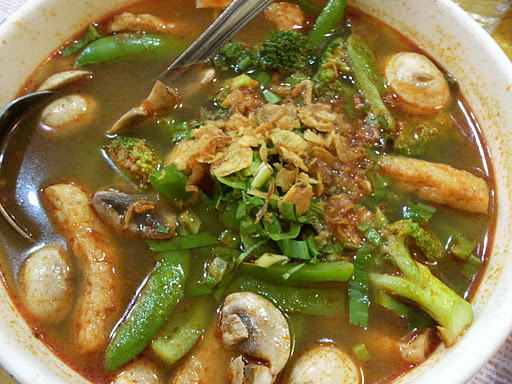 I was craving a giant bowl of soup,and ordered the Canh Thap Cam house special soup. While the soup was packed with vegetables, it was a little bland.I watched the vegetarian hot pot pass my table with envy. No matter – chili oil to the rescue! If you’re in the neighborhood, and craving Thai/Vietnamese, give them a try.